Your transaction page is your accounting home base. It’s where your data lives and where you can view, modify, and manage the transactions in your various accounts. We'll run through the upgrades and changes for this page here. If, prior to the upgrade, you hadn’t added any transactions into Wave, then upon landing on the page, you’ll be prompted to add an income or expense transaction or to connect your bank account to automatically import transaction data. 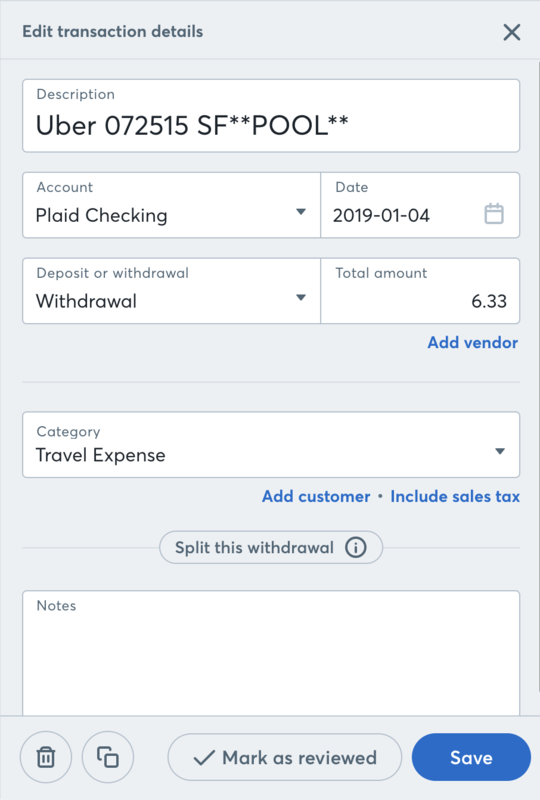 Clicking the More button will open up a drop-down menu containing the options: Add journal transaction, Connect your bank, or Upload a bank statement. When you add a new transaction or select one you’ve created, a detail panel will open up on the right side of the page. Using this menu, you’ll be able to specify the transaction type (Deposit or Withdrawal), the account it belongs to, and the category to which it is assigned. You can include a sales tax, split the transaction, and mark it as reviewed from the details panel. New accounts can be added from the Chart of Accounts page under the Accounting tab, while any new sales taxes can be added in the Sales Taxes page in the Settings menu. These options are no longer available from within the Transactions page. You can now find your transactions more easily by clicking the Filters button at the top of the page. The filters that used to sit permanently at the top of the page are now expandable, allowing you more screen real estate to view your transactions. You can also filter by specific account by clicking on the account drop-down in the top left corner of the page. You may also notice that there are no longer numbered pages. Instead, you’re able to use filters to speedily view any historical transactions. If you want to view more transactions on a single page, scroll to the bottom of the page, and click Load More Transactions. This may seem like a dramatic change, but rest assured: this upgrade was designed with you in mind, and we're confident that you'll find your experience to be deeper, more streamlined, and more easily understandable than ever before.